One recurring dispute in college athletics has been over whether or not college athletes should be paid. I remember listening to debates over this when I was a college athlete and, decades later, I am still listening to them. One addition to the debate has been over licensing deals—for example, the NCAA has licensed the likeness of college athletes for use in video games and the players have received nothing for this. In fact, players are forbidden from receiving any specific compensation for such things. The obvious counter is that the college athletes who are in the big money sports (football and basketball) do get compensation in the form of scholarships, coaching, medical care, etc. Given the cost of higher education these days, a full scholarship to a college can be worth $25,000 a year or even much more (my nephew is attending a college that costs about $42,000 a year). Even athletes in the other sports (such as track, cross country, field hockey and volleyball) can receive compensation in the form of scholarships, coaching, and medical care—although typically less than that received by star athletes in the big money sports. As such it can be asserted that athletes are already paid—in that they receive valuable compensation for their contributions. In fact, college athletes have been recognized as being employees with the right to unionize—at least for now (this is being challenged legally). As such, the actual dispute is over the amount and nature of the desired compensation—a classic employee-employer dispute. Obviously enough, the NCAA and the colleges want to keep the player compensation to a minimal level. However, the fact that they would rather not provide better compensation is not proof that athletes should not receive more. While the NCAA and colleges are fine with specific sorts of compensation (such as scholarships), they are rather draconian about college athletes receiving most other benefits. For example, if a college athlete places in a local road race and the award is a gift certificate, the athlete cannot accept it without violating the NCAA rules and possibly being booted from the team. While, as noted above, the NCAA and the college can license the likeness of a player for use in a video game, the player cannot. As such, the vast majority of the money made in college sports flows to the NCAA and the colleges, rather than the players. On the face of it, the players should receive compensation commensurate with their contribution. For example, if a player’s likeness is licensed for use in a video game, he should receive a suitable percentage of that deal. As another example, if selling the TV rights to football games bring in millions of dollars, the players who appear on TV should get a proportional cut. Obviously, the value of what the players receive in terms of other compensation must be factored in as well as part of their pay. In some cases, the athletes might already be getting fair compensation. However, the star athletes in the big money sports are probably not—given the money they are bringing in. I do admit that this has some appeal. When I was a college athlete, I competed for that reason—I loved to race. I still do—and these days I pay the entrance fees to run in road races (although I do still win from time to time). I get the idea of the amateur athlete who is not sullied by crass commerce and not driven by greed. Of course, the amateur athlete who is unsullied by greed must be in a matching context: a complete amateur environment driven by the love of the sport. When I was a college athlete, I was in that context. I competed in cross country and track, both of which are not big money sports. I also went to a division III school—so there were no athletic scholarships. The coaches at the college generally followed the same model that is usually seen at public high schools—they had a primary job at the school and coaching was secondary. For example, the cross country coach was also an exercise physiology professor. The football coach also taught classes. So, we were all amateurs competing for the love of the sport—although we did get boxed lunches and the coaches got some pay. When everyone is an amateur and the compensation is rather minimal, it certainly makes sense to not pay athletes and to hold them to the standards of being an amateur athlete (versus being a paid professional). However, this is not the case with the big money sports at the big schools. First, the top coaches enjoy truly impressive salaries. There are twenty four college coaches who make over $3 million a year. Interestingly, the highest paid public employee in many states is a college football or basketball coach. Second, college football is a multi-billion dollar industry and college basketball brings in millions for the colleges and NCAA. Most of this comes from TV revenue. While the players get some of this in the form of scholarships and other compensation, the vast majority of it ends up going to others, such as well-paid NCAA officials. Given the extremely generous compensation for everyone else, it would certainly seem that these college sports are not amateur in any meaningful sense of the term and that the context is not one defined by a love of the game. Rather, this is a big money industry in which those doing the vast majority of the work receive very little while a very few benefit greatly from their efforts. In short, college sports mirrors the larger society. The lie used to avoid justly compensating the athletes is that they are amateurs who are supposed to play for the love of the game. Thus, there is a clear inconsistency between the reality of the situation and what is expected of the athletes. In terms of becoming consistent, there seem to be two options. The first is to make college sports amateur and played for the love of the sport. This would require following the model of amateur athletics that I mentioned above: minimal compensation for everyone, coaches who are professors first, athletes who are students first, no big money deals, and so on. As should be blindingly obvious, this is not going to happen. The second option is to accept that these big money sports are simply a college version of the pro-sports and they should follow that model: the big money remains, but the athletes are recognized for what they really are—professional athletes. This will mean less money for those who are currently enjoying that massive funnel of cash, but this is what is morally and honesty require. Sports that are not big money and colleges that are not in the big money can still operate in the spirit of amateur sports and those that are motivated solely by the love of the game and who wish to be true amateurs can compete in those sports or at those schools. Like most people, the highway of my life is strewn with the wreckage of my numerous failures. When I was a younger man, I looked at failure as a matter of disgrace and resented each failure. While I sometimes engaged in the shameful practice of shifting the blame to others, I learned to accept the wisdom of Confucius, namely that when the archer misses the target he should seek the cause within himself. Or, as this is expressed in the West, it is a poor craftsperson who blames his tools. While I still regard failure as potentially disgraceful and worthy of resentment, I have learned to have a somewhat more developed view of the matter. After all, while I must bear the responsibility for my failures and they are most often entirely my fault, a failure need not be a matter of disgrace. Most obviously, if I have done the best that I could have done and still met with failure, then there is no disgrace in this. No more could have been expected of me, for I did all that I could possibly do. There are, of course, challenges that we face that are beyond us—what matters in such cases is not that we have failed, but that the challenge has been justly and bravely faced. After all, to fail well can be better than to succeed poorly or wickedly. Perhaps it could even be argued that a noble failure is a form of success. One thing that repeated failures have taught me is that there will be more failures. On the one hand, this view can easily lead to despair: if we can be sure that the road ahead will also be littered with the wreckage of failures, should we not greet this future with tears and lamentations at our fates? On the other hand, this view can lead to confidence and hope: have we not survived the wrecks that litter our pasts? Have we not had victories as well? Surely, there shall be more victories in the future and the failures shall be endured as they have before. Another thing that my repeated failures have taught me is that failure is just another chance to succeed. For example, when I was in high school, I decided that I wanted to be on a sports team. Since basketball was a prestige sport and I had played before, I have it a try. I was awful and after one of the tryouts, the coach said to me “we have an important position for you. We need a manager.” I said, “Coach, I need to do a sport.” He replied, “Go out for winter track. They have to take everyone.” I went to the track practice the next day, wearing my basketball sneakers. I found that track had its own tryouts—the coach tested everyone’s abilities to see how well a person could jump, sprint, or throw. It turned out that I could jump seven feet forward from a standing start, but could not long, triple or high jump worth a darn. I was also found to be unsuitable for sprinting, hurdling and throwing. So, I ended up where people without any talent in the prestige events ended up—I was slotted to be a distance runner. Being in poor shape, the practices were tough. By throwing up, I learned to not eat before I ran. By having my feet torn up and bloodied by the basketball shoes, I learned I needed to get better shoes. I was a poor runner my first season and a poor runner in the spring track season that followed. However, by the time cross country arrived, I could run without throwing up and without bringing shame to my ancestors. When I went off to college, I stuck with running and went all-conference in cross country. I am still a runner today. Without my failure at basketball, I might have never become a runner—so, I owe my success to that failure. As a second example, when I was in college I thought that I was a good writer, so I sent off some of my work to a game company. I received a brutal rejection letter in reply. I kept at it, earning a stack of rejection letters. However, one day I got the letter I had been waiting for—my work had been accepted. I did the same thing in philosophy—earning a stack of rejections before earning a publication. Lest anyone think that I am a Pollyanna, I will say that I have encountered defeats that seem to still remain as failures—aside from the lessons learned from them, of course. But even in those cases, I did succeed at learning to not fail in that way again. Also, I recognize that there can be failures that put an end to all opportunities for success—that is, failures that are complete failures. However, saying “failure is just another opportunity for success, except when it is not” does not have the same appeal as the original. As a runner, martial artist and philosopher I have considerable interest in the matter of the will. As might be imagined, my view of the will is shaped mostly by my training and competitions. Naturally enough, I see the will from my own perspective and in my own mind. As such, much as Hume noted in his discussion of personal identity, I am obligated to note that other people might find that their experiences vary considerably. That is, other people might see their will as very different or they might even not believe that they have a will at all. As a gamer, I also have the odd habit of modeling reality in terms of game rules and statistics—I am approaching the will in the same manner. This is, of course, similar to modeling reality in other ways, such as using mathematical models. In my experience, my will functions as a mental resource that allows me to remain in control of my actions. To be a bit more specific, the use of the will allows me to prevent other factors from forcing me to act or not act in certain ways. In game terms, I see the will as being like “hit points” that get used up in the battle against these other factors. As with hit points, running out of “will points” results in defeat. Since this is rather abstract, I will illustrate this with two examples. This morning (as I write this) I did my usual Tuesday work out: two hours of martial arts followed by about two hours of running. Part of my running workout was doing hill repeats in the park—this involves running up and down the hill over and over (rather like marching up and down the square). Not surprisingly, this becomes increasingly painful and fatiguing. As such, the pain and fatigue were “trying” to stop me. I wanted to keep running up and down the hill and doing this required expending those will points. This is because without my will the pain and fatigue would stop me well before I am actually physically incapable of running anymore. Roughly put, as long as I have will points to expend I could keep running until I collapse from exhaustion. At that point no amount of will can move the muscles and my capacity to exercise my will in this matter would also be exhausted. Naturally, I know that training to the point of exhaustion would do more harm than good, so I will myself to stop running even though I desire to keep going. I also know from experience that my will can run out while racing or training—that is, I give in to fatigue or pain before my body is actually at the point of physically failing. These occurrences are failures of will and nicely illustrate that the will can run out or be overcome. After my run, I had my breakfast and faced the temptation of two boxes of assorted chocolates. Like all humans, I really like sugar and hence there was a conflict between my hunger for chocolate and my choice to not shove lots of extra calories and junk into my pie port. My hunger, of course, “wants” to control me. But, of course, if I yield to the hunger for chocolate then I am not in control—the desire is directing me against my will. Of course, the hunger is not going to simply “give up” and it must be controlled by expending will and doing this keeps me in control of my actions by making them my choice. Naturally, many alternatives to the will can be presented. For example, Hobbes’ account of deliberation is that competing desires (or aversions) “battle it out”, but the stronger always wins and thus there is no matter of will or choice. However, I rather like my view more and it seems to match my intuitions and experiences. In the previous essay, I addressed the matter of the state’s contribution to an individual’s success (and failure). Naturally, no discussion of success would be complete without a discussion of genetics. While the role of genetics in human behavior is a rather complicated matter, it does seem eminently reasonable to accept that genetics play at least some role in success (and failure). Interestingly, these genes might not all be human—there are some interesting new findings regarding the role of the bacteria that live in us (which outnumber the cells in the human body 10 to 1). Thanks to years spent in athletics, I have had access to an informal laboratory in which I could observe various factors at play when it comes to success. As might be imagined, genetics probably plays a rather significant role in athletic success (and failure). Being a runner, I will limit myself to running, but the same points can be applied to other aspects of life as well. One rather obvious role of genetics is body type. As people who run or at least watch competitive running know, the top runners tend to have a rather specific body type. While much of this results from training, there are factors that are genetic. After all, no amount of running will give a person longer legs. There are also the factors that one cannot see, such as the efficiency of the cells when it comes to handling the energy requirements of competitive running. While these factors can be influenced by training, natural ability (which is probably largely based in genetics) does have a significant impact and this is supported by my own years of competitive running. Having run in high school and college, I was able to observe runners who were in the same training programs, had similar backgrounds and lived in similar conditions. However, performance obviously varied quite a bit even among people who followed the exact same training. In my own case, I was fairly lucky—while I lacked the easy high school success of “natural athletes”, I found that training really paid off for me. In contrast, some other runners worked as hard (or harder) than me, yet did not meet with the same level of success. 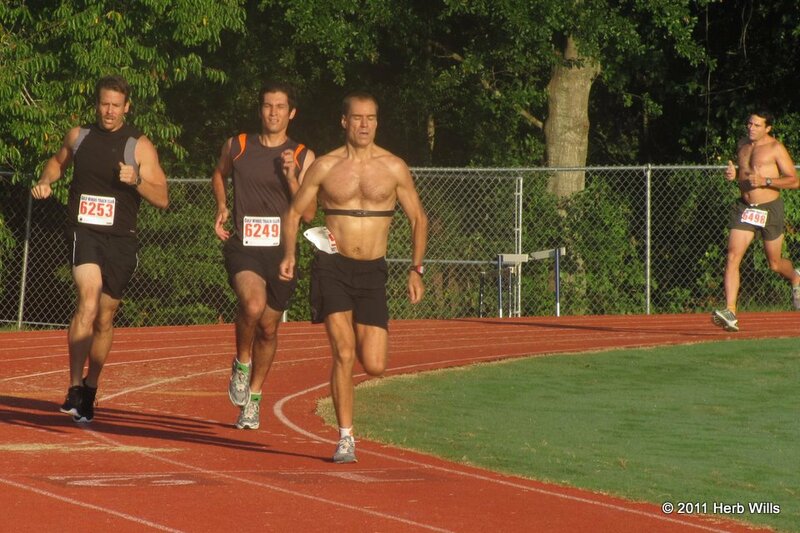 Of course, there were also runners who trained as hard as I did (or less) who did much better. After graduation, I was no longer on a team, but still trained with other runners. Obviously, some people I trained with and ran with step-for-step were better than me and some were worse. I also found out the obvious—no matter how hard or smart I trained, I would never be able to make the Olympics (although I did run against some of the best American marathoners in Ohio back in 1992). It makes sense to attribute some of this failure to genetics—my body simply cannot match what the Olympic marathoners can do, despite all that training. Of course, it also makes sense to attribute some of my success to genetics—while I do not have Olympian genes, I have brought home plenty of trophies. Plus, as we old runners say, running is itself a victory. Not surprisingly, people often turn to the study of twins to attempt to sort out what is genetic and what is not. After all, twins are supposed to be genetically identical and hence any differences between them would be non-genetic in nature. Interestingly, it has turned out that twins are not actually identical, thus entailing that some differences might be genetic. There has also been some recent interesting work regarding the bacteria that inhabit the human body and their influence on such factors as health. Oddly enough, it might be the case that some of a person’s success is due to his bacteria. While the physiological aspects of running and other activities at which one might fail or succeed seem to be strongly influenced by genetics, there is obviously a rather open question as to how much genetics impacts what might be called the mental aspects of success and failure. Going back to running, training and competition have very significant mental elements. For example, there is the matter of having the will to train as needed. As any runner will tell you, real training hurts. Of course, racing hurts more—a big part of being a competitive runner is having what Hobbes called the will to hurt. Only in this case it is the will to hurt yourself rather than others. As might be imagined, if the “mental” aspects are as influenced by genetics as the physical aspects, then much of a person’s success or failure rests in these genes. For example, if the ability to finish a race despite a broken leg is not a matter of the will of the athlete, but a matter of the structure of his brain that resulted from the genes that constructed it, then he did not succeed. Likewise, if a runner is “broken” in the final sprint by a tougher runner because of the genetics of their nervous systems, then he has not failed. Shockingly enough, the essay ends as it began, with the question unanswered. After all, we do not know how much the genes influence our success (and failures). But, I got to write about running and that is a success.